공신녹권(功臣錄券)이란 공이 큰 신하에게 왕의 명을 받아 공신도감에서 발급해주던 문서를 말한다. 이 「개국원종공신록권」은 태조 4년(1395)에 이성계의 조선건국에 공로가 있는 김천리(金天理)에게 공신도감에서 발급한 공신녹권이다. 문서에 기록된 인원은 총 695명이며, 필사본으로 기재된 이 문서는 1989년 지정된 개국원종공신록권(국보 제250호)과 동일한 내용으로 인명의 수와 발급내용이 같다. 다만 국보 제250호는 목판과 활자를 같이 써 간행된 것으로 이원길에게 발급된 것이다. 이 문서에는 한 변의 길이 6.5㎝의 ‘이조지인(吏曹之印)’이라는 도장이 45군데에 찍혀있다. 문서의 끝에는 당시 녹권에 관련된 공신도감의 임원인 녹사, 판관, 판사, 이조별감 등 18명의 명단이 적혀 있으며, 이들 중 13명의 명단 밑에 수결(서명)이 있다. This document certifies the king’s bestowal of the title “meritorious subject” on a courtier -- in other words, a government official recognized as having made major contributions to the state. 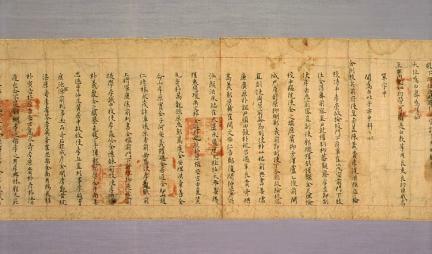 This certificate was issued in 1395 (fourth year of the reign of King Taejo of the Joseon Dynasty) to Kim Cheon-ri, who rendered a meritorious deed for the establishment of the Joseon Dynasty. 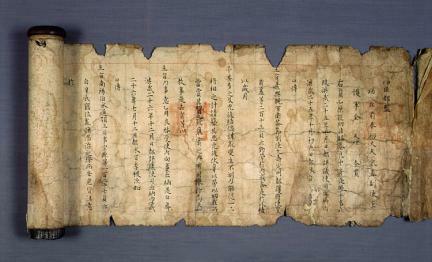 The number of persons recorded in this document was 695, and this copy is similar to the Certificate of Meritorious Subject Issued to Yi Won-gil (National Treasure No. 250) in terms of the number of persons and contents. This document bore a seal 6.5 cm wide in 45 places; at the end of the document is a list of 18 persons who were the officials in charge of issuing the certificate. In the list, 13 of them affixed their signatures below their names.